Is it possible to have subforms? I would like additional questions to show up directly beneath a selected checkbox in the primary form instead of beneath the entire field. Now, to see how it works click on "B". It will start showing other questions. 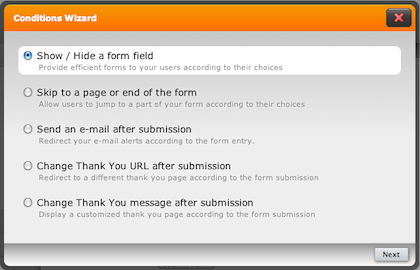 You can create condition by clicking on "Conditions" button on the form builder. Then choose "Show / Hide Questions" options and go from there. Yes but when you click it shows below the entire field thus below C instead of within the field below B. So it's not really a subform as much as a hidden part of the main form. If you need it to work like that, create separate questions for each checkbox. Then you can hide/show fields after that checkbox. Not seeing anything that says "Conditions". Can you please elaborate a little on where that option is? On the form builder, click on "Setup & Share" tab on the toolbar. Then click on "Conditions" button. Use the first option to show/hide questions on the form. SHOW "Why are you a B?" field. When "What Letter Are You?" Equals To "B"
SHOW "What is so great about being a B?" field. Is it possible to have a subform that can collect a subset of responses? For example, I'm building a form in which I'd like to know what countries a person is going to and the dates they will be in each country. Can I have those responses add to a separate form that can collect as many responses as necessary?